Well guys, you all must have heard of PFDC- The Pakistan Fashion Design Council, that is one of the most anticipating and awaited events of Pakistan! 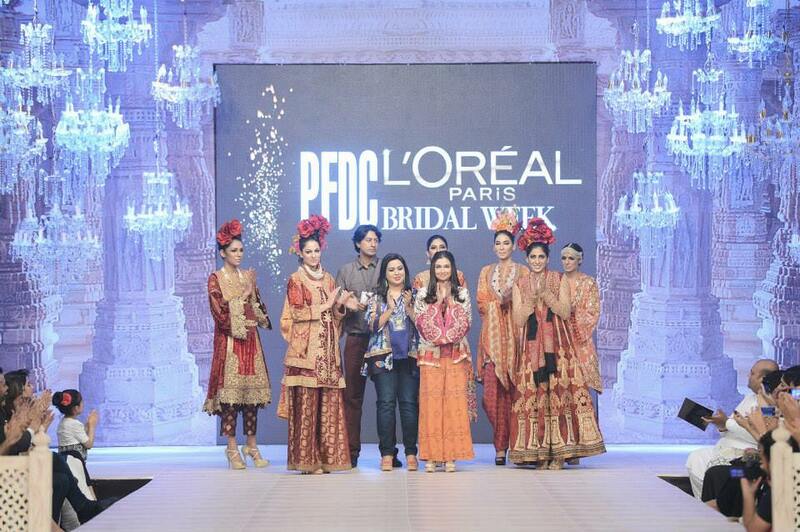 The innovative and pioneering PFDC in association with the world’s foremost beauty brand “L’Oréal Paris” disclosed the names of the fashion designers that took part, along with the details on their corporate synergies for PFDC L’Oréal Paris Bridal Week 2014 -2015 that was held in Lahore from September,30 to October,2 (2014). 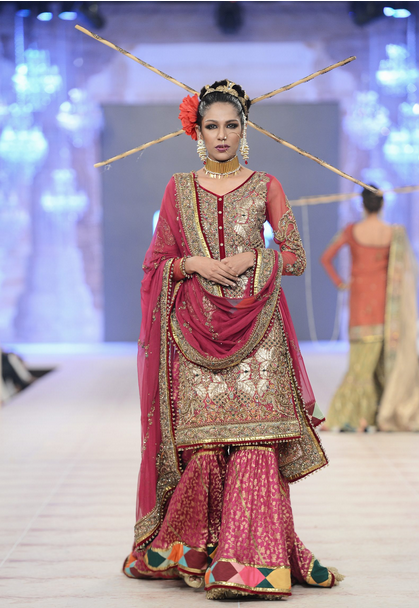 This platform is set to depict and reveal the modern-day and the traditional Pakistani-Bridal-Fashion, hair-trends and makeup-styles, mingling to create the “look” for the 2014-2015 bridal season. 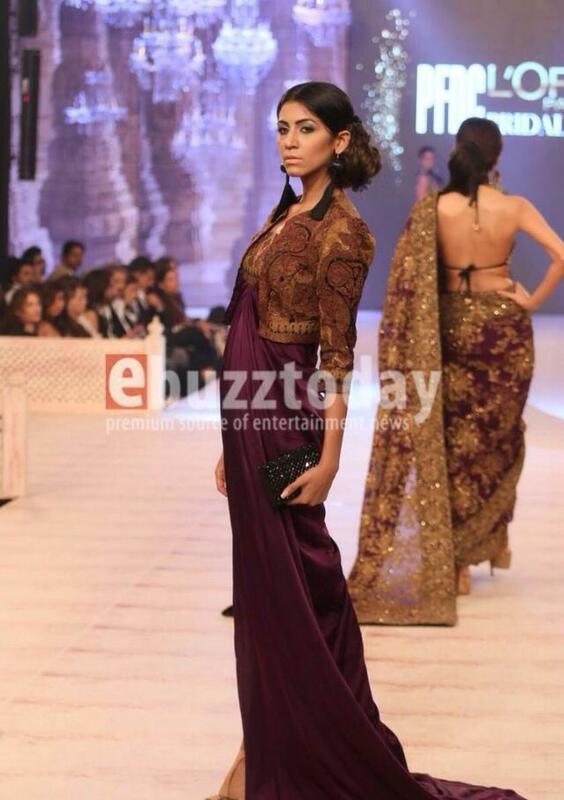 All our renowned models took part in the event. 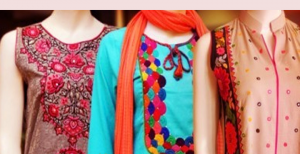 PFDC is the first Pakistani brand that has extended in the Indian market with it’s own name , with standalone multi label- retail store, that symbolizes Pakistani designers. 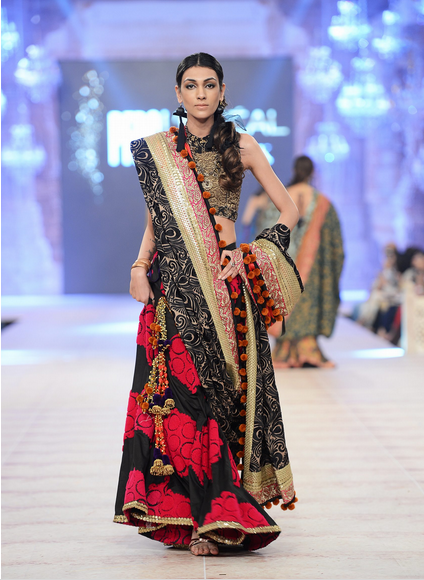 Uptil now, PFDC has revealed almost 40 fashion jewelry & bridal designers, in tandem with the prestigious makeup and styling artists each year. 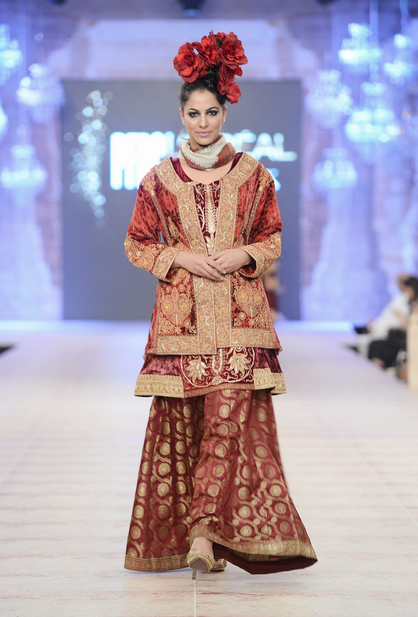 The very first day of Bridal week started off with Pakistan’s leading and legendary designers laying out their hottest arrivals of the year by featuring different sort of bridal jewelery, costumes, sherwanis, couture dresses, salwar kameez, punjabi suits, kurta pajama, fancy and embroidered outfits, anrakali frocks, gown style, angrakha style, front open double shirts, full length and floor length gowns, churridar suits, casual tops, formal kurta shalwar kameez for men, lehengas, gaghras, kurtis, pajamas, trosuer, wide open umbrella frocks and much more. 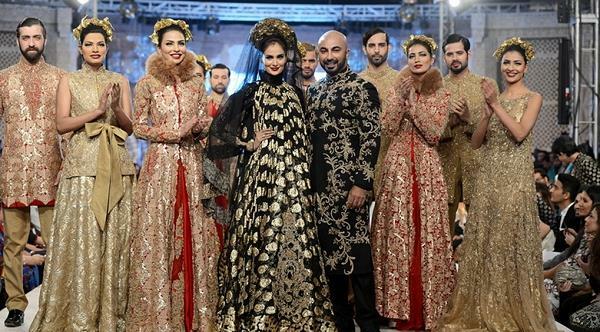 First day begins with HSY, and was followed by another eminent name Saniya Maskatiya , accompanied by other pre-eminent designers like Saira Shakira, Karma Red, Zara Shahjahan, Fahad Hussayn and many others. 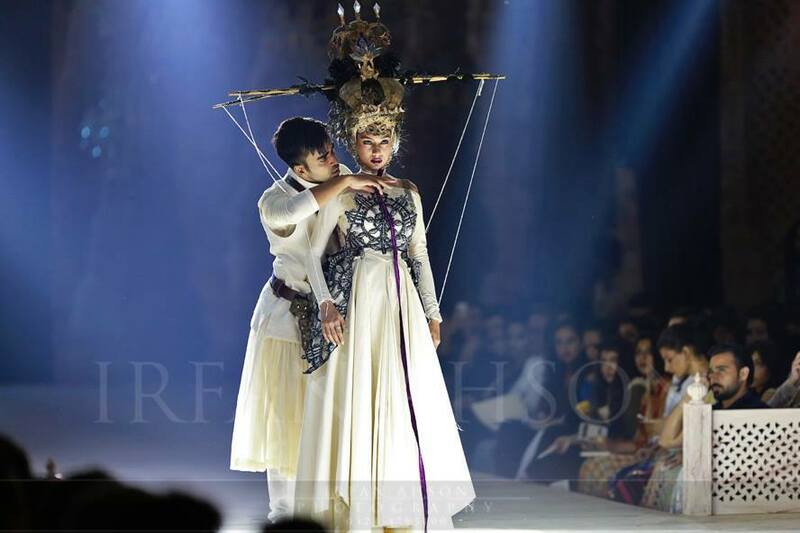 Day one’s Makeup for women’s-wear was done by Maram & Aabroo , and Khawar Riaz for men’s-wear, while Day-2 and Day-3’s makeup for both women’s-wear and men’s-wear was done by Nabila/NGENTS. 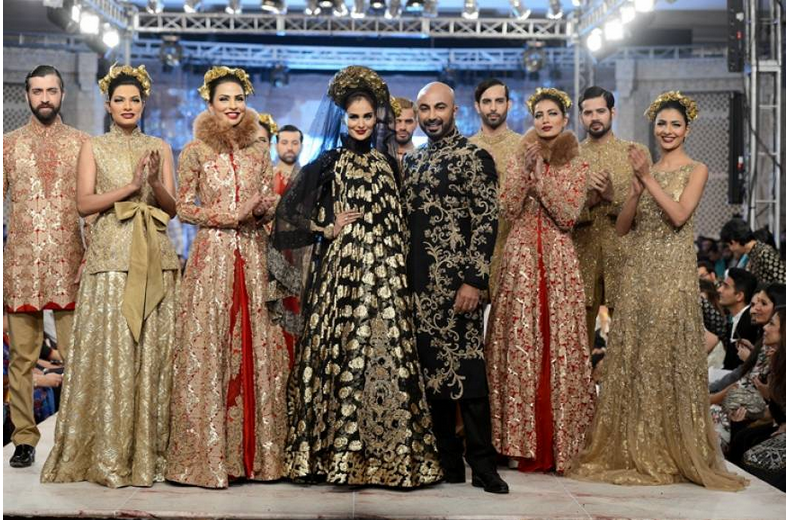 The day 1 of PLBW commenced with the celebrated and fêted Hassan Sheheryar Yasin , who’s been partaking for the fourth consecutive time. This time he showcased his new and innovative collection named “Divine.Decadence”, that is basically a luxury Bridal couture collection! The main inspiration and motivation for the collection derives from his deliberation of 20 years in the industry and due to his tours. 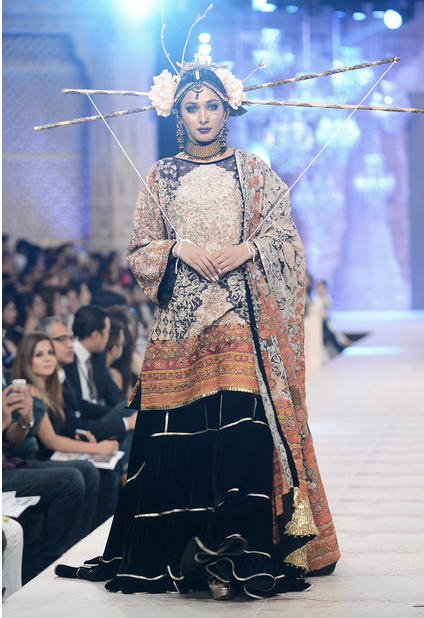 This collection is an expression and demonstration of HSY’s hallucination concerning contradictions in our cultures and societies. This collection in essence has two different parts: “Divine” facet included the natural shades, principally featured aqueous shades. “The Decadence” aspect was based particularly on dark color tones like golds , blacks , reds. 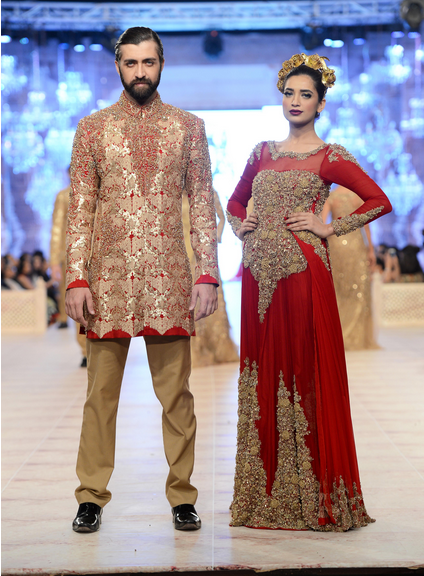 HSY used vibrant and pulsating tones , with the range both for men and women with a diverse set of pieces including tunics , suits , gowns , suits etc. 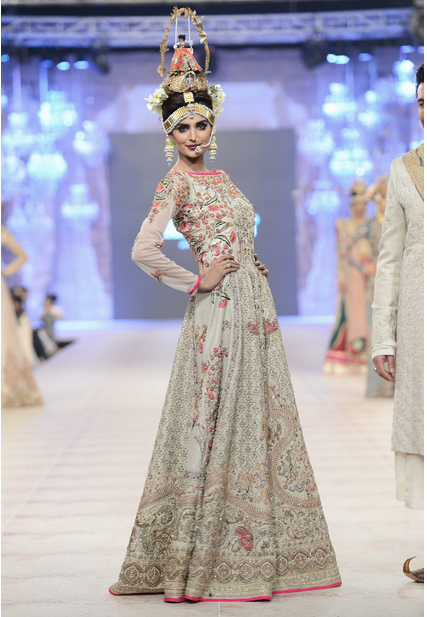 The Divine wear chiefly were based on hand – embroidered silks and jacquards adorned with silver crystals while that of the Decadence pieces featured gowns and other stuff of western sort of bridal wear. 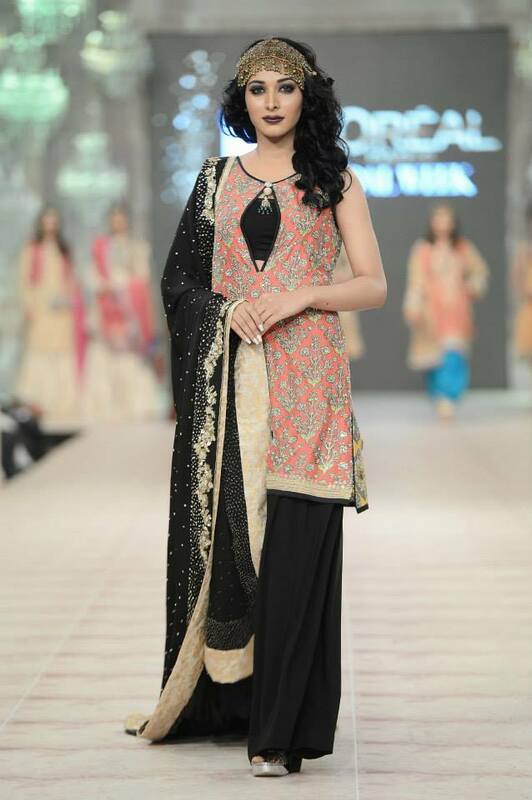 Sania-Maskatiya displayed her exquisite and superlative collection “Ara-Ornaments”. 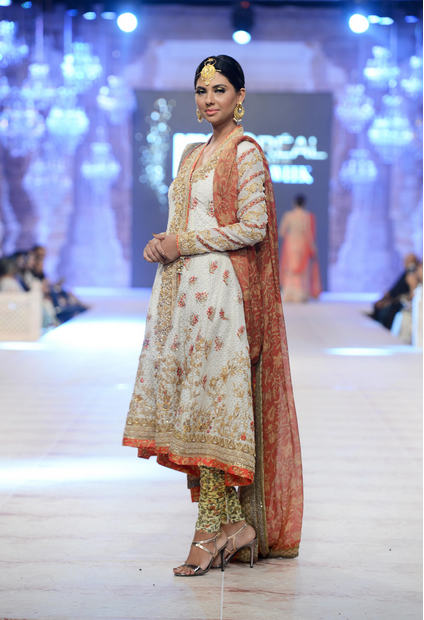 It was the second time that Sania-Maskatiya took part in PBLW that wins over inspiration from the knack of adornment and ornamentation. With the signature of “Sania-Maskatiya-Cuts”, it attributes & features the enhancing motifs that are in-style and well-liked from over centuries. The intricate flowery and floral designs were adjacent with the geometrics. The compilation flaunted a unique and exclusive bridal-collection , that would give any bride of the modern times, alluring and elegant appearance! A combined effect of celebration with classiness and fantasy with elegance. 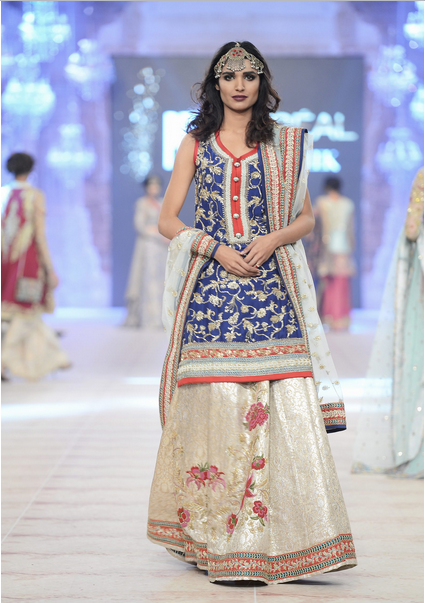 ‘Ara-Ornaments’ presented an array of Indian nets, lamé, cotton nets and matchless digital prints, worked with delicate and beautiful zardozi, resham, gota with pearl work. 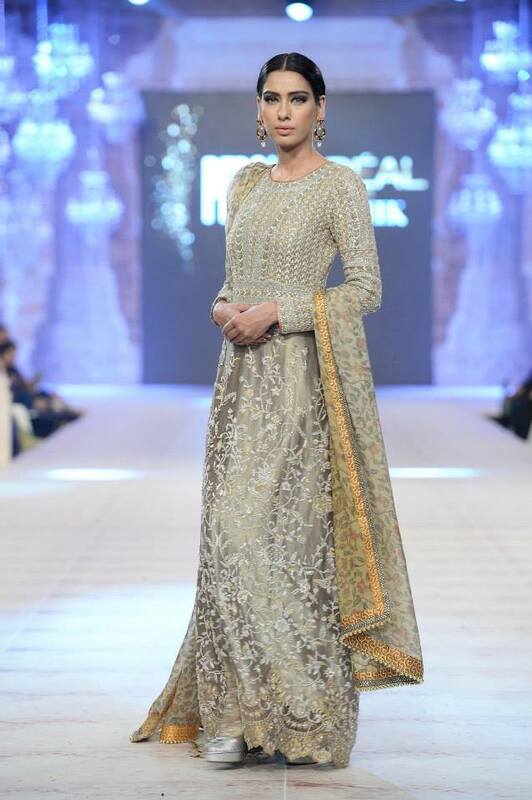 Sania collaborated with Shafiq Habib Jewelry/accessories and for foot wear teamed up with Keith and Charles at PLBW show-case. 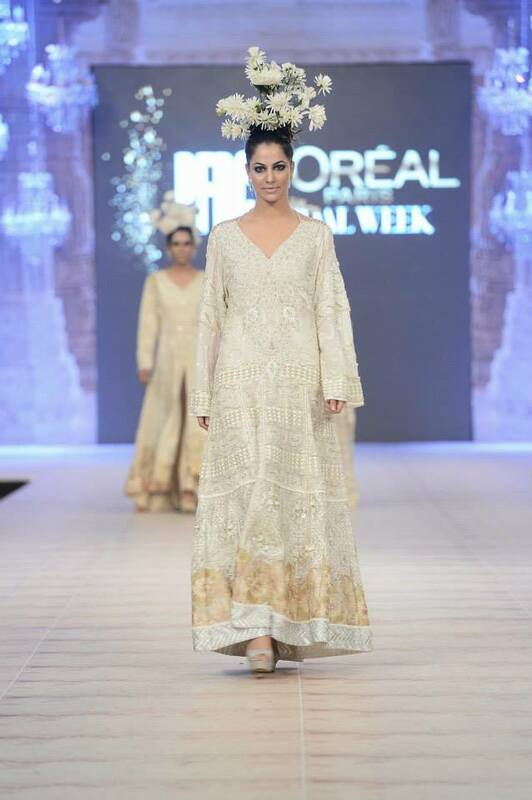 The Day-2 of PFDC Loreal Bridal Week was set off by Shamaeel-Ansari with her collection titled as “The Wedding”. 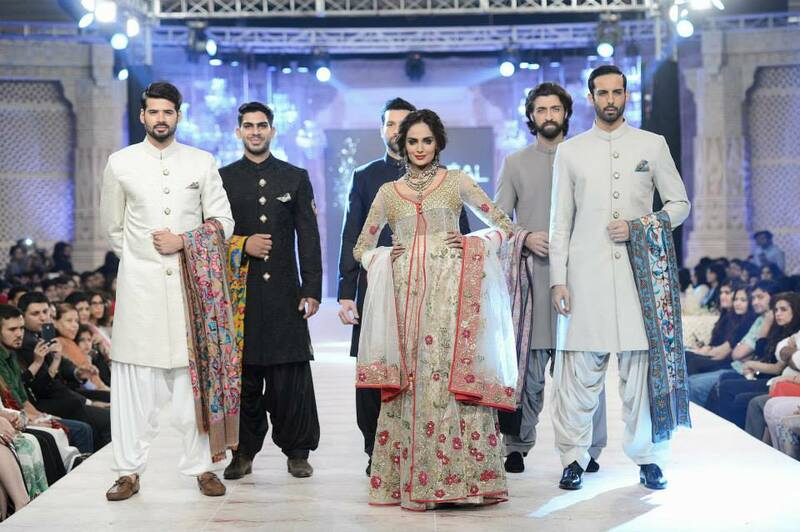 The compilation included pieces for all the wedding functions comprising of bridal-outfits for all occasions of mayun, nikkah, mehndi, barat together with the outfits for the sisters of groom and bride. 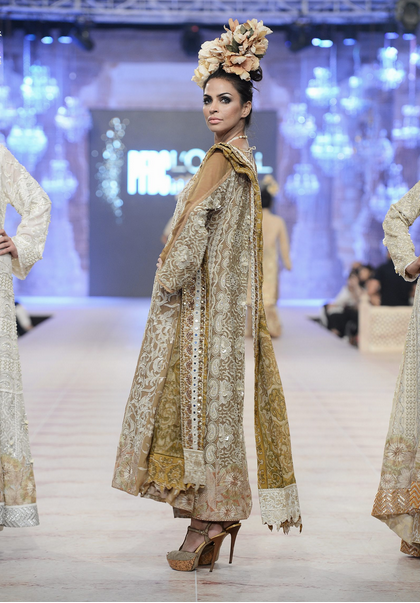 The ensembles had been designed on thread embroidered stuff, lush silks with a traditional vintage coiled work of gold, along with the revival of antique tankas with thread work and embroideries. 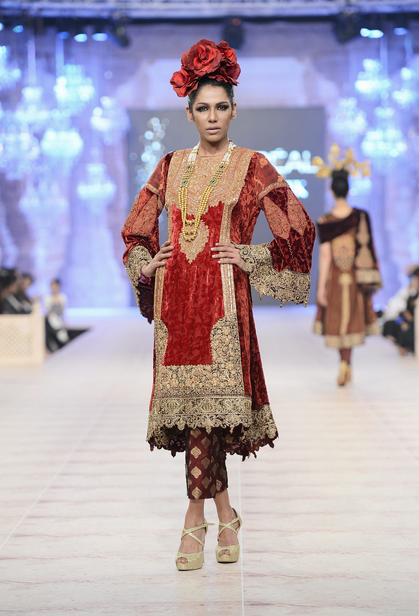 Shamaeel has used a very unique range of colors including burnished metallic, Marrakesh reds, saffron, pristine ivory, dramatic black and many more! 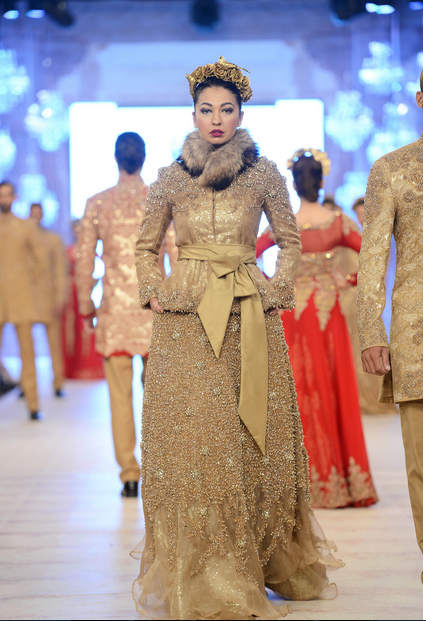 Comprising of embellished and festooned coats, that could be worn by all age-groups, and shorter cuts for juvenile gals. The jewellery for the showcases of designers for provided by Waseem-Jewellers. Succeeding Shamael-Ansari, Fahad’s assembly was put on view! 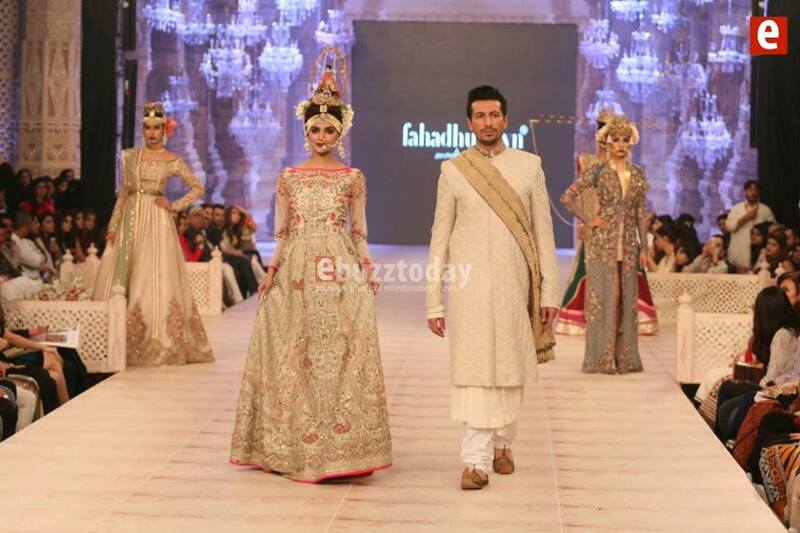 His assembly titled “Putlighar”, that was chiefly a Bridal-collection. 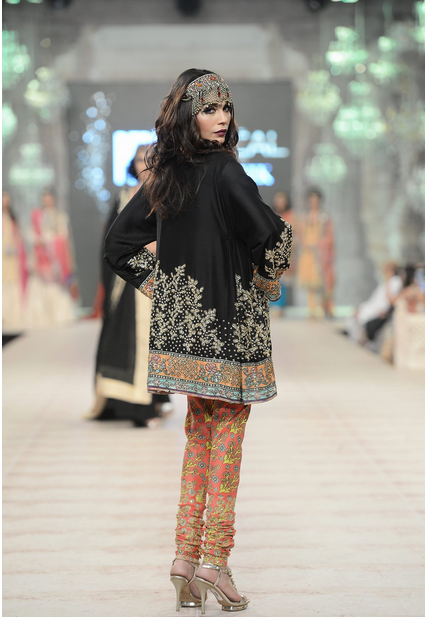 This anthology featured a wide gamut of prints embellished with 3D patterns and cutouts, with vintage hues and amalgamation of time-honored craft with the contemporary techniques. 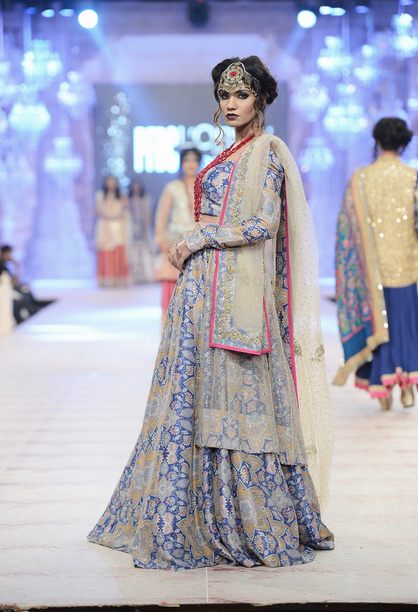 The designer mainly used traditional zari work, thread work, 3D embellishment and on printed bases added the vintage tone of tilla. Mainly enthused by the Thatta and Cholistan dolls, Fahad-Hussayn portrayed and revealed the royalty ruins all the way through the region. An ideal merge of aristocratic magnificence and splendor! The palette of colors varied from the slight shades of nudes & gold to a rebellion of colour with dramatic volumes & cuts that were harmonized with drapes and details of metal. 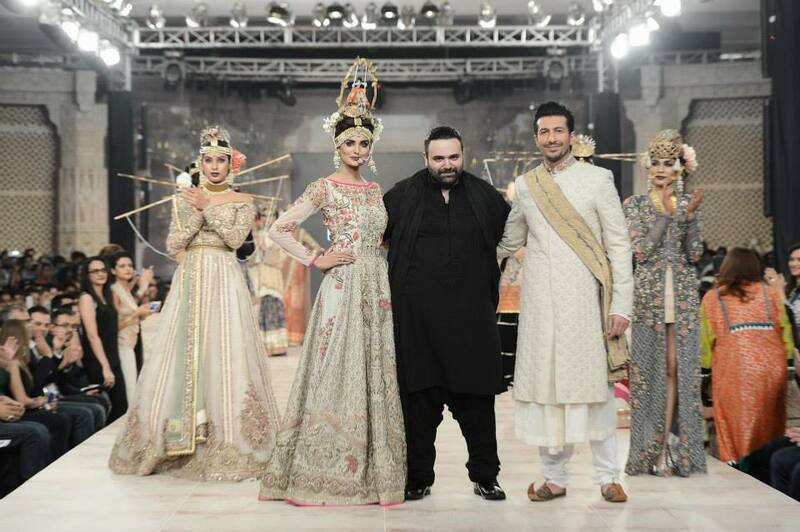 The proverbial TV star Waqar Ali Khan also participated in the designer’s exposition of collection, as the stopper of show. 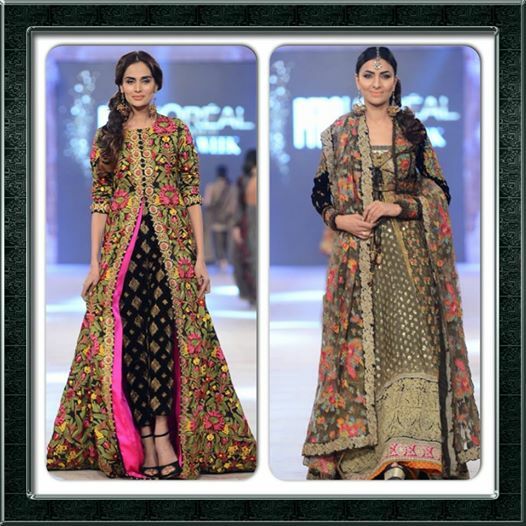 The late-night shows were set off with the designer Zara-Shahjahan, whose bridal-collection named “A Folk Tale ” was a mingle of spectacular and vivid colors, the prints with heavy eastern ornamentation. 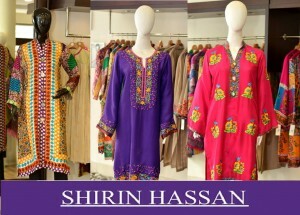 Her collection unveiled 25 ground-breaking designs , used with perfect range of colors like red, black, pink, fuchsia, saffron and more. 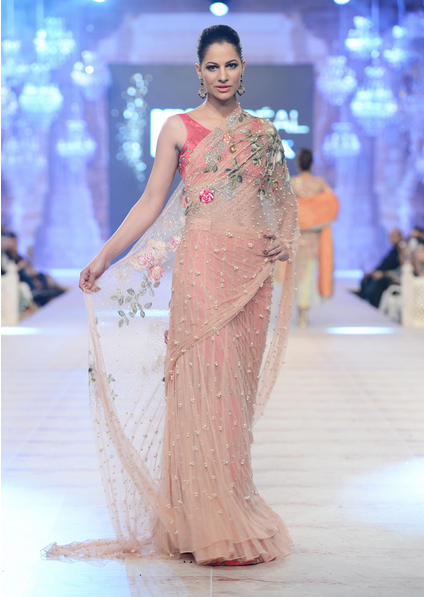 The material included cotton net, raw silk, jamawar , tulle that were embellished with the traditional handi-work of pearls, dabka, sitara, naqshi , mukesh, French knots etc. 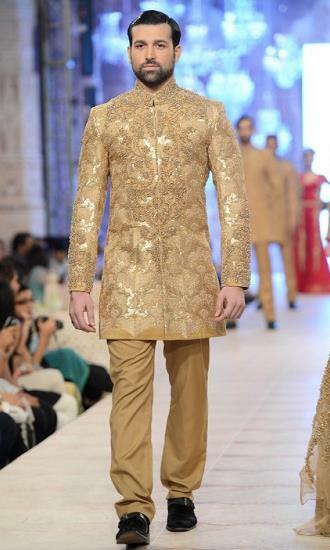 Additionally, it also included 5 men’s wear pieces. 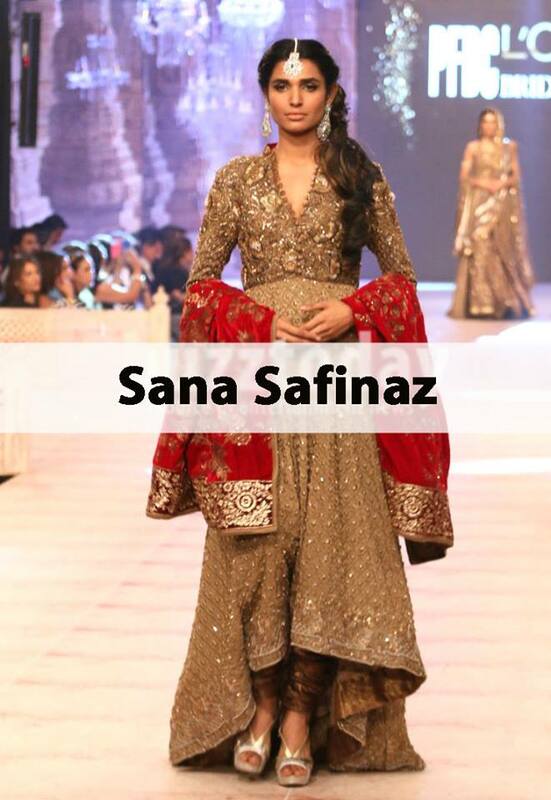 Finally, the fourth day of PFDC Loreal Paris Bridal Week was staged by a prominent designer-label Sana Safinaz! 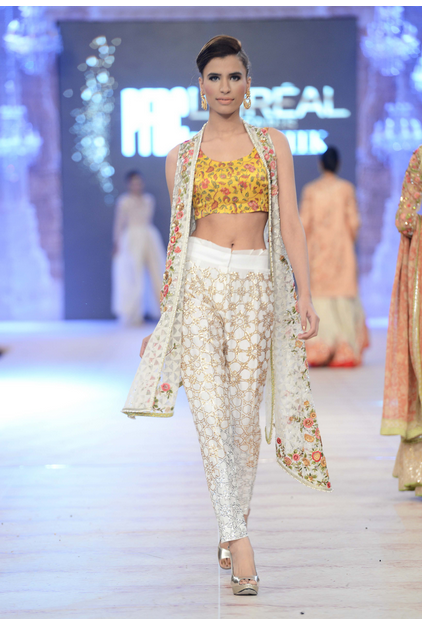 This energetic designer displayed his collection that featured an eclectic fusion of modern and conventional wear, toned up with bright colors, and combined with charily selected cotton, net, satin and machine work. With the promotion of aesthetics of east & west, this brand made the first move towards shorter shirts with delicately and deftly embroidered shawls!